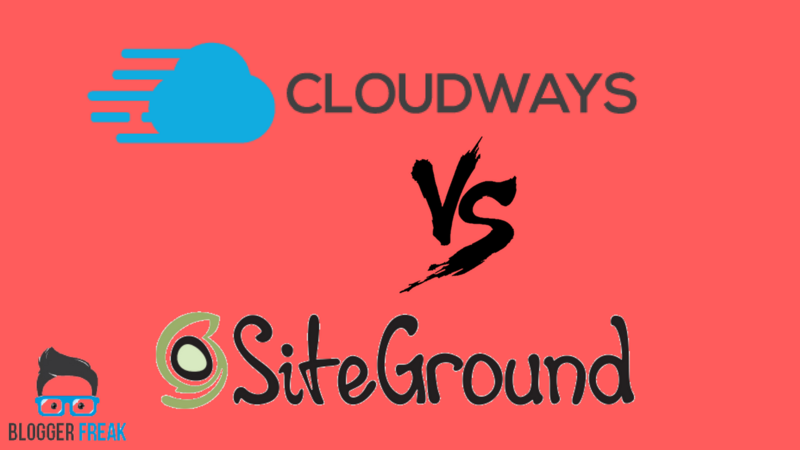 Cloudways vs Siteground - Which is the Best Cloud Hosting Providers? If you have decided to go with either of the web hostings. Then, taking a look at our Cloudways vs Siteground review would suffice the need for the best choice for your website or blog. In this article, I am going to compare the two best Cloud hosting provider company across the globe. Cloudways and Siteground are two most talkative hosting providers in 2018. 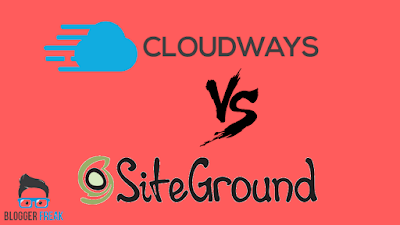 Here, I will compare Siteground vs Cloudways on different parameters, which will help you to decide your cloud hosting partners. These two are one of the most searched. If you have done a research and narrowed down your search that fine. If you would like to add more info to your knowledge. Read the article. Talking about the SiteGround this one has some added advantages over CloudWays. SiteGround has the more stable environment and the pricing is quite lower than its counterparts. But there is a situation when you need a good hosting for the heavy trafficked website. CloudWays could be the better solution then. Let’s frame the article into parts to review both the hosting on its Features, Pricing, Support, and Performance. The following web hosting companies are reputed among masses and best in their respective features. But there can only be one single winner. Let’s be clear in that and start the review series. CloudWays is one of the popular web hosting company founded in 2009 since then it offers fully managed as well as cloud-based hosting to its users. CloudWays takes pride in hosting a large website with heavy traffic flow and people searching for such host can consider this for manage administration. SiteGround basically founded 5 years prior to Cloudways, and its popularity among all age groups. They offer premium hosting for users offering dozens of services for WordPress, Drupal, Magento and more. SiteGround has curated more than 450,000 domains registered with them. Luckily, SiteGround securely stands out from the crowd offering users with a free domain for a website when you buy the hosting from them. If you have it already it starts getting more cheaper, Currently a big leap from CloudWays. SiteGround cuts the time by half when setting up things in it. CloudWays do not provide a free domain. As you know CloudWays offers its best support to Amazon web services as well as DigitalOcean. Thus, they are planning for more services to come and include it in their services. CloudWays plans to differ with SiteGround plans. The plans and pricing are completely depended on the selective server and size. If you desire to start with the price for $5-$230 per month. Thereafter, if you look at the nominal plan you’ll miss out server important features. Hence, most peoples prefer to go with the $15 Cloudways plans. In respect to that SiteGround offers attractive plans and pricing option. With just starting $3.95 per month with domain free. SiteGround make things competitive in the area of fearless and honest pricing. If the pricing is the major factor for you then, you can find the SiteGround to be a step ahead of CloudWays. Siteground, as well as CloudWays, claims to offer 99.99% guaranteed uptimes. And, we have seen this true to out believe. Anyone looking for a strong performance with feature-rich hosting. I would definitely tell them to choose SiteGround over CloudWays. Due to top server response among top hosts, the page response time is well maintained by 300ms. CloudWays has its unique set of features that make it favorable for hosting large website. Following are some of the most liked features. SiteGround is most popular among two. That’s why let's see why people consider choosing SiteGround over another hosting. CloudWays is having one of the best ticketing systems with quick response time. With Cloudways offering a comprehensive knowledge and keen on solving queries of their customers. Whereas, SiteGround helps its customers in a similar way offering a collection of library article from where users can take help and resolve queries. They also offer 24x7 phone support for emergency situations. In respect to that, they do have a live chat support as well. Their live support is also extremely fast. The last but most important one would be offering SiteGround meetups in different cities. In the world of hosting, I have seen people talking about features and pricing. To a certain extent, some hosting companies are right-fit for your needs. If you’re not a developer and desire to host a website then, you may end up picking the wrong host, especially for a beginner I suggest you to go for SiteGround. SiteGround is cheap and it takes no time to set up maintain a website. With an added advantages over the free domain, support. They are popular among other hosting providers offers good customer satisfaction. With equivalent in speed, performance and anything that you look for when buying a hosting. 2. Choose any plan you’re comfortable with. 3. Pick a free domain of your choice and proceed to the next step. 4. Now, you get a preinstalled setup wizard. Do your job! 5. And, get ready for brilliant hosting experience with SiteGround.